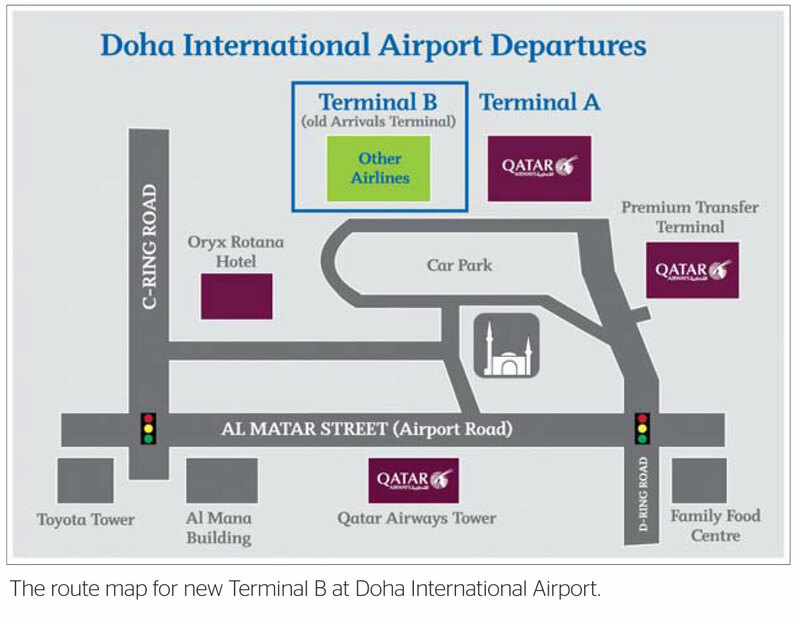 Doha International Airport (DIA) is preparing to open its new Terminal B - a dedicated facility for foreign airlines - before June end, in time for the summer holiday rush. As a result, the check-in area of the existing transfer and departures terminal - to be renamed Terminal A - will be used exclusively for Qatar Airways. This will facilitate the increased passenger traffic through Doha International Airport until the state-of-the-art New Doha International Airport (NDIA) opens in 2012, an official said. The new 2,000sq m Terminal B, developed on the premises of the former arrivals terminal at DIA, will be dedicated to more than 30 foreign airlines operating services from Doha. They include Emirates, Flydubai, Kuwait Airways, Jet Airways, Pakistan International Airlines, Lufthansa, Oman Air, Turkish Airlines, SriLankan, British Airways, KLM / Air France, Royal Jordanian, Sudan Airways, Air Arabia, Middle East Airlines, Air India Express, Saudi Arabian, Yemen Airways, Shaheen Air, Iran Aseman Airlines, Gulf Air, Nepal Airlines, Iran Air, Syrian Arab Airlines, Etihad Airways, Egyptair, Bahrain Air and Biman Bangladesh Airlines. Highlights of the new terminal include an enlarged check-in area with 35 counters, including an online check-in lounge, a dedicated customer service desk for oversized luggage, a currency exchange bureau, ATM machines, a new high-tech baggage handling system and food and beverage outlets. "An enlarged 600sq m immigration hall with 10 counters and three e-gates will prevent long queues and ensure seamless and hassle-free passport clearance formalities," the official said. "Following their respective immigration counter areas in both terminals, passengers walk into the common airside environment of the existing Transfer and Departures building and have access to the same present-day retail shopping, airport lounges, prayer rooms, food court and other facilities." "The move of foreign airlines to Terminal B allows Qatar Airways to ramp up service for its passengers, who will benefit from a more spacious check-in area at the current departures facility, renamed Terminal A, and exclusively dedicated to the main carrier of the airport," the official said. Terminal A forms part of a multi-million dollar DIA re-development plan that will also see further boarding gates being introduced and the Oryx Lounge undergo a revamp. The Oryx Lounge, located airside on the upper level of DIA, caters to first and business class passengers of other airlines. The lounge, which offers a business centre, shower facilities and a wide selection of snacks and refreshments, can be accessed for a nominal fee of $40 a person when travelling in economy class on any carrier. As part of the DIA infrastructure development project, there will be new exterior roadway signage directing passengers to the two airport terminals. 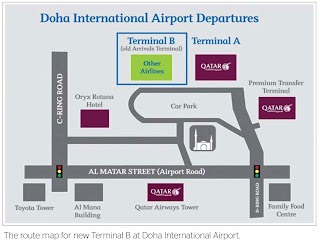 Doha International Airport is managed and operated by Qatar Airways. Qatar Airways Group chief executive officer Akbar al-Baker said the changes were aimed at "enhancing customer experience" ahead of the opening of the New Doha International Airport. "After the opening of the new stand-alone Doha Arrivals Terminal last December, we are now pleased to inaugurate the new Departures Terminals as the latest step in the infrastructure improvements to handle the increased influx of passengers through the airport," he said. "Our aim is to provide travellers with an enhanced travel experience. The upgrade of Doha International Airport is part of a multi-million dollar investment in improved facilities ahead of the opening of the New Doha International, which promises to be one of the most advanced airports in the world," al-Baker added. With its thriving economy fuelled by multi-billion dollar projects and the 2022 FIFA World Cup on the horizon, Qatar is receiving a growing number of business and leisure travellers.